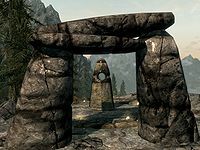 The Ritual Stone is one of the thirteen Standing Stones scattered across Skyrim, located east of Whiterun. It is located to the east of Whiterun by the roadside, above the entrance to Graywinter Watch. "Once a day, those under the sign of The Ritual can reanimate nearby corpses to fight for them." 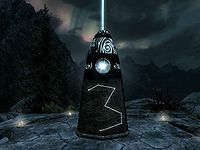 Activating the Ritual Stone grants you the power to raise corpses to fight for you for about one hour of in-game time. The power also allows you to raise corpses that can usually not be reanimated, such as mammoths or giants. The bodies do not turn to ash after the effect expires and there is no limit to the amount of corpses you can reanimate. The stone is on a rock outcrop between the road leading east from Whiterun and the White River. A path leads from the road, around the outcrop as it climbs and passes under several squared off arches. At the top is a hostile, leveled necromancer who will attack as soon as they are aware of you. They are standing beside the standing stone and will raise two skeletons to help them with the fight, one of these is an archer and the other uses a one-handed sword and iron shield. A circle of candles surrounds the stone and a few paces to the southeast is a blue mountain flower. If you reanimate a corpse and make it follow you to a location with more corpses (or NPCs that you can kill), you can end up with a large number of reanimated followers. The Ritual Stone power spreads out in a sphere several feet wide around the player when cast, reanimating any npcs or creatures within its radius. The Ritual Stone power works on corpses up to level 75. This limit can be increased using the Necromage perk. Placing the Ritual Stone power inside the Aetherial CrownDG allows you multiple castings by removing and equipping the crown. This can be used to build potentially unlimited armies of undead. This page was last modified on 7 January 2019, at 05:24.